I’m finally getting around to finishing the recap of what I’ve worked on in November. After this post it will be time to move on and leave November behind. So in November I finished three pairs of socks, we’ve already established that in another post. 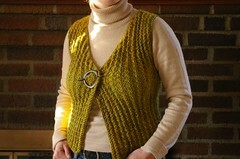 But not only did I do that but I finished a bigger garment, my first one since my ill-fated Fitted Tank. 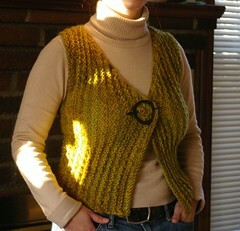 I came back with Stitches East with the Celtic Vest kit from Fleece Artist and cast on almost right away. I knit and knit some more and before I knew it, I had a finished garment, something that wasn’t a pair of socks! I have worn it once already and will wear it again soon! I added 8 stitches to the cast on aware from someone else’s experience that 10 stitches was 2 stitches too many. I wasn’t sure all along that I would have enough yarn but I had plenty and could probably have done each front a row or two longer. I’m happy with the vest even if the rows pull a bit across the chest. I’m quite pleased with how my new pin works well with the vest as well. More details here on Ravelry. Another big achievement of November was a new set of box bags. Jewel from Yo! Knit special-ordered one from me so I took the opportunity to sew a few more. A friend of mine is going to start carrying them in her shop so I figured I’d get a head start on making them! It took me 3 days but in the end I have 7 beautiful box bags. The top three ones are the small size and the bottom 4 are the large size. The one in the middle (Kaffe Fassett Pansy print) has gone off to Jewel but the others are available for purchase, they don’t all have to go to my friend’s store! I have individual photos of them here as well. 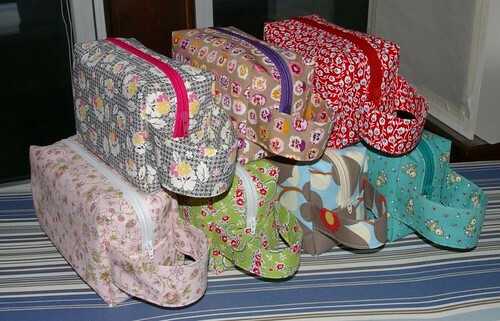 I debated for quite a while as to where I would sell my box bags if I started making more. I was thinking about etsy and I was thinking about my friend’s shop, the Iron Horse Farm gift shop in Sherborn, MA. I decided to go ahead and bring my bags to the shop but that I would still show them here if psome of you were interested. I’ll always be available for custom orders as well. So once in a while you’ll see me post a photo of my bags, I hope you don’t mind! Your vest came out great! It really looks nice on you. I don’t think it pulls at all. Great vest! I hope you can sell the bags. I love mine!! Cute vest!! My bag came yesterday and I can’t wait to use it. So I got in ahead of the curve with my new box bag! The vest turned out really well! Oh, no, I love to look at box bag – and one of them may totally strike my fancy. Love it! It looks great on you. Love the color too. The shape is so simple, yet I can see how it’s flattering on a bunch of different body types. Nicely done. your vest is fantastic! I’m itching to start a vest for myself soon. As its been very, very chilly here! Your bags are fantastic, mine has to be my favorite wip bag! Can you tell me if I I purchased a small or a large one? It has just the right amount of room!